This Spicy Balsamic Vinegar Salsa is a great way to use fresh tomatoes from your garden or from the Farmer’s Market. 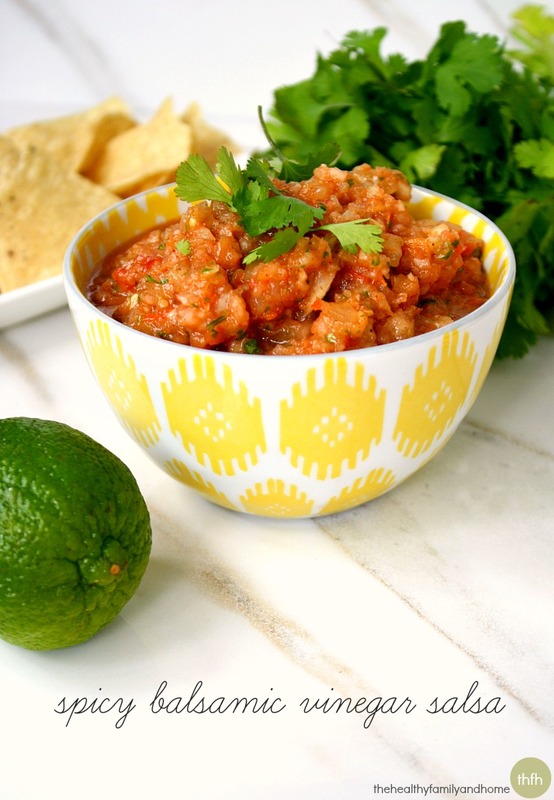 I didn’t think I could ever love homemade salsa as much as I love my classic homemade version or my Raw Tomatillo Salsa, but my new Spicy Balsamic Vinegar Salsa is a pretty good contender. 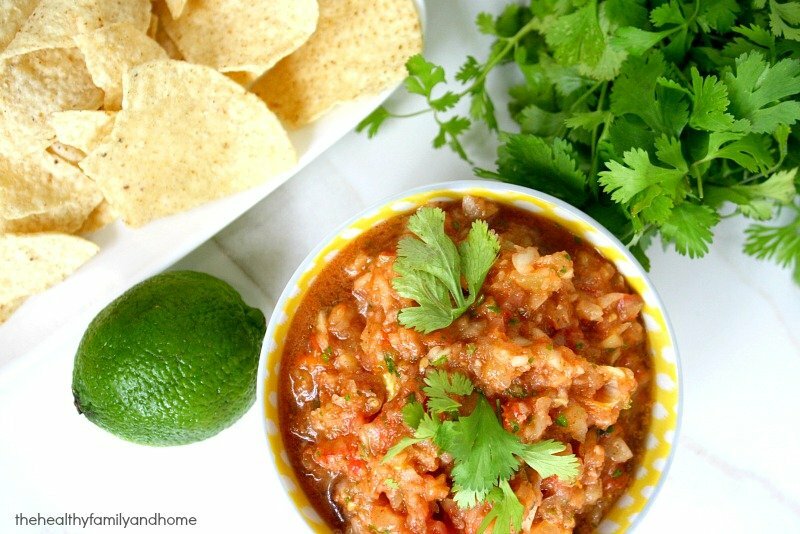 The special ingredients that give this salsa an extra kick is the addition of balsamic vinegar and chili powder. The brand of balsamic vinegar I use (365 Aged Balsamic Vinegar of Modena) is vegan and Non-GMO Project Verified. I didn’t realize this until recently, but regular white vinegar is commonly made from wine derived from corn, so it’s really important that any vinegar products you use are organic or Non-GMO Project Verified. This fun summertime salsa is really easy to make with a food processor and you will probably have all the ingredients already on hand. Want more healthy dip recipes? Check out Pineapple Guacamole, Cilantro and Lime Salsa, Field of Greens Zucchini Hummus or my Clean Eating Cookbook with an entire chapter of 20 healthy, clean eating dips and dressing recipes just like this one that you will love! Tip #1: Feel free to adjust the seasonings (chili powder, Himalayan pink salt, cilantro, onions, garlic, etc) to your preference. Tip #2: I like to use roma tomatoes to make mine, but you can use any type of tomatoes. 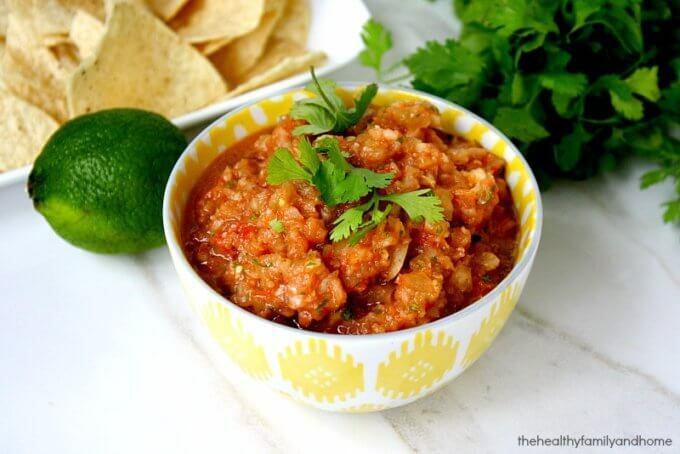 The type of tomato you use can change the color of the salsa too. When I use roma tomatoes, it seems to have a darker color than when I use tomatoes from the Farmer’s Market. Tip #3: This recipe will make approximately 1 – 2 servings. Step 1 Put all ingredients into a food processor and pulse about 20 - 25 times. The recipe and photographs for "Spicy Balsamic Vinegar Salsa" by Karielyn Tillman of The Healthy Family and Home are licensed under a Creative Commons Attribution-NonCommercial 4.0 International License and cannot be used without my written permission. What a great idea to add balsamic vinegar to give it some zing! I have to try this!